Twelve years ago, my sister Shauna and I were diagnosed with breast cancer. We had multiple surgeries, chemotherapy, and other unpleasant treatments. We made it through together and hoped that it was over forever. It is with a broken heart that I write this... My sisters cancer is back. Although it was caught early, it is in her spine as well. Thankfully there have been many advances in metastatic breast cancer in the last 12 years. Fortunately Shauna is a strong, brave and most importantly a true warrior! I know she will beat this. She is my hero! So this year we are once again committing to participate in YSC Tour de Pink, a three-day, 200 mile bike ride for breast cancer. My sister may not be able to ride all the miles but we are doing this ride in her name! We want to raise funds to benefit all those young women, including my sister, who need the Young Survival Coalition's support in fighting this terrible disease. Please help us with a donation. Your donation will go to support Young Survival Coalition and ensure that no young woman faces breast cancer alone. YSC is the premier organization providing supportive services and education resources for young women affected by breast cancer. YSC Tour de Pink is much more than just a bike ride, it’s a chance to honor survivors, raise awareness and support important programs for young women affected by breast cancer. I hope I can count on you to help me reach my fundraising goal! $1,200 could pay for two young women to travel to our annual conference for young women affected by breast cancer. God Bless you my "brown" friend!!! I know you will do great... you and your sister keep being awesome!!! 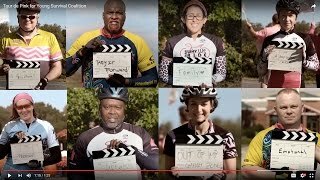 We look forward to seeing and riding with you on Saturday! Go Team Sisters! Sending ?? and all the positive thoughts! Wishing you many prayers and may God always be with both of you. Good Luck Tamara and Shauna! Thinking of you girls! #girlpower???? Thinking of you, Tamara - sending hugs. Love you! Praying for Shauna's remission and a safe ride for you both!! In honor of Tamara Martin & Shauna Martin! Prayers going up for Shauna! Wishing you the best on your ride. Praying for Shauna is recovery!